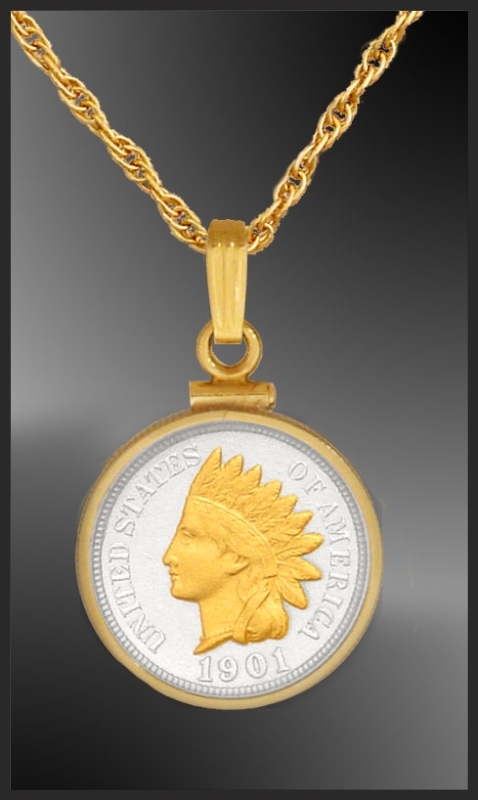 Indian Princess Penny Necklace, The coin mount is 14K gold filled, hung on a durable 18" IP gold chain. 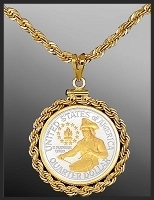 The coin is selectively highlighted in 24kt gold & pure silver. The Indian "Princess" Penny is one the most collected coins in US history. Highlighted in 24kt gold and pure silver and protected by our unique Lenscote polymer, it will stay beautiful for many years. The classic stlye coin mount is 14K gold filled, it hangs on a durable 18" IP gold chain. Uniquely numbered signet, certificate of authenticity and lifetime warranty against defect.